This review is in part a celebration of the beneficial interaction of community groups. Maria Benotti’s Music at Eden’s Edge has been providing concerts to under-served locations on Boston’s North Shore for 31 years. The Historic Manchester Trust, an ambitious non-profit, was formed to look after that town’s historic fabric. The Trust’s first restoration project, of a small chapel in a town-owned cemetery, made the venue for Sunday’s wind quartet concert useful and attractive again. The dignified and handsome Rosedale Cemetery in Manchester-by-the-Sea contains many Victorian monuments. (One memorial stone well known to Manchester residents is for Algernon Booth [1869-1877,] the brother of the famous Shakespearean actor Edwin Booth as well as of the assassin John Wilkes Booth, whose ghost is rumored to roam the grounds.) The cemetery’s 1904 Crowell Chapel, a beautifully restored Neo-Gothic granite pile originally intended for mortuary purposes, began a new life as a concert venue last January. The lofty space with hammer-beam ceiling is well lighted and pleasantly reverberant. Its seating for about 130 in perpendicular pews could be ameliorated, though, with some cushions. 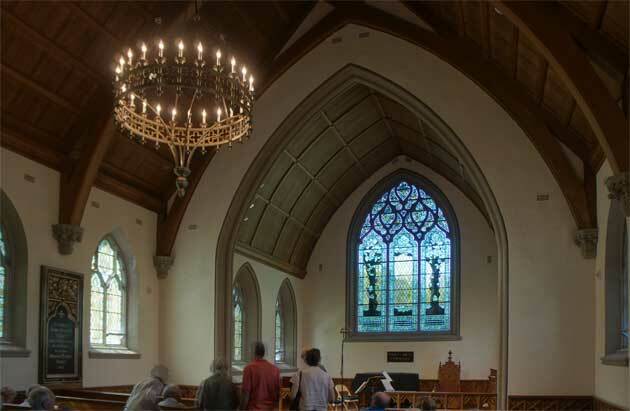 Indeed, a fair amount of revenue could be generated for the chapel’s ongoing maintenance if management made seat and back pads available for rental during intermission. But fear not, Christopher “Woody” Kelly, the Trust’s director, is currently perusing appropriate fabrics. 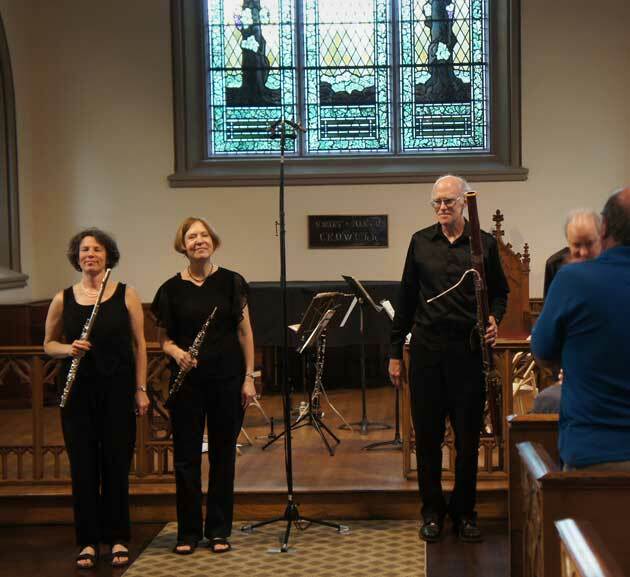 For Sunday’s concert, the fifth in the series since January, Music at Eden’s Edge provided a quartet of winds in the persons of clarinetist Stephen Bates, flautist Jill Dreeben, oboist Charlyn Bethell, and bassoonist Neil Fairbairn. These experienced artists offered five permutations of their forces that included diverse trios and two quartets in music of mostly obscure composers. Though Vivaldi was certainly familiar to the suburban Manchester audience, I suspect that Françaix, Goepfahrt, Tansman, Arnold, and Zoeller were not. Wind ensembles can almost always be counted upon to play in tune and with clear and accurate ensemble. Composers can generally be counted upon to write music for them that requires little more, though I’m certainly aware of noble exceptions such as Mozart’s Gran Partita and Barber’s Summer Music. Arriving at the concert with such expectations, nothing I heard disappointed me. The players were well matched and seemed very much to enjoy each others’ company. Oboist Charlyn Bethell compared the outing to a conversation among friends. And there was much of that as each player had as much chance to play the big tune as to accompany it — to palaver as well as to nod in agreement, as it were. Rather than discuss every one of the six pieces on Eden’s agenda: Goepfart’s Quartet, op. 93; Tansman’s Suite for Reed Trio; Zoeller’s The Three Virtuosos: Musical Joke; Vivaldi’s Concerto for Flute, Oboe, and Bassoon; Arnold’s Divertimento for Flute, Oboe, and Clarinet; and Francaix’s Quartet for Winds, I would rather treat just the two that I think represented the most satisfying performances. Polish composer Alexander Tansman (1897–1986) wrote in a neoclassical style with nods to Stravinsky, Poulenc, et al. Though his Jewish birth forced him to flee Europe in 1941, he was lucky in his friends; Charlie Chaplin signed his visa permitting him to become one of Hollywood’s émigré composers. His work there included the score for Barbara Stanwyck’s Flesh and Fantasy. His Suite for Reed Trio (1949) received a vivid performance from clarinetist Stephen Bates, who later reminisced about playing Hail to the Chief in the US Marine Corps Band many years ago. For the Tansman, he was joined by the equally lively oboist Bethell and bassoonist Fairbairn in an engaged performance that reveled in the contrasts and colors. The music was alternately spiky and poignant, and the players seemed alert to its every turn. The closer, Jean Françaix’s somewhat familiar Quartet for Winds, was another musical keeper, though in the frothy French style. The playing had rhythmic urgency, broad range of colors and dynamics, and most importantly, some real swing.